On a photo. Crystals of beryl from the state of Minas-Zhvrays (Brazil). Down: short-prismatic crystal of beryl with the distinctly exposed hexagonal habitus. 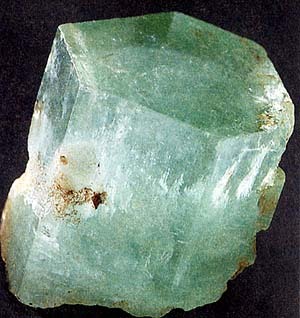 Beryl besides an emerald and aquamarine has a number of varieties. Name he got it from greek beryllos, probably having the Indian origin; primary value he is not set. In antiquity from colourless Beryls did optical glasses. 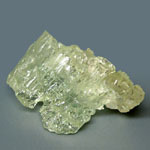 The varieties of beryl, different in color, have the different point-of-sale names. General properties of all of Beryls it is been stability in relation to different reagents, except for hydrofluoric etching acid, and also transversal separateness and fragility (at the prelum of Beryls cracking easily) and glassy off-gloss. Berilly is crystallized in emptinesses of granit pegmatites, greisen and quartz vein, lode, mines. They are obtained also from the barks of weathering on pegmatites and alluvial mineral deposits. Goshenite - colourless transparent Beryl. Got the name at the place of find - Goshen in the state Connecticut (USA). It is sometimes used for the imitation of diamonds and emeralds (thus under stone underlay silvery or green foil). Tablitchatuyu the variety of colourless beryl of goshenite is named by rosterite. In chemical composition of beryl, one of main base jewels, natrium sodium, potassium, lithium, calcium, caesium, rubidium, scandium, fluorine and hydroxyl, can also enter. The type of crystals is prismatic, quite often tops are wrong chippy or end with bipyramid (dipyramid). 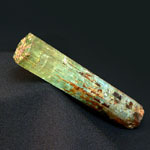 Greenish Beryls at heating acquire the aquamarine colouring. Berilly is polished, as a rule, step cutting. At opaque differences at treatment aim to expose the effect of "cat's-eye" or asterism, polishing them cabochons. The variety of colourings is given by an occasion to mix up Beryls with very much by many jewels. Sizes are notable: copies are not uncommon in a more than 1 m high and by a diameter 20-30 sm of Beryl without admixtures usually colourless, but more frequent than all has light-blue-green or, rarer, yellow and rose colouring. The most valuable varieties of beryl, known as an emerald and Aquamarine, are painted in green and blue colors of different tints. Crystals are hexahedral prisms. 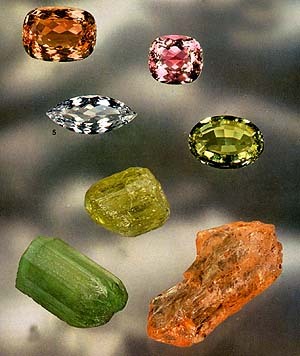 Varieties: emerald, Aquamarine, Heliodor, vorobyevite (jewels), rosterite. Be found in pneumatolite-hydrothermal mine deposits, in pegmatites, greisen, quartz vein, lode, mines and other Ore of beryllium (Be). Chemical composition (chemistry, compound)-maintenance (in %): BeO- 14,1, Al2O3 - 19; SiO2 - 66,9; the admixtures of natrium sodium are marked, potassium, lithium, caesium, rubidium, iron, vanadium, sometimes chrome. Colors transparent intense-green chrome-bearing is an emerald, blue (greenish-blue) - Aquamarine, golden-yellow, gold - Heliodor, pink, rose caesium-bearing - vorobyevite (Morganite), very rarely meetings red - bixbyite, colourless - rosterite (Goshenite), dark blue Maxis-Beryl. Crystal structure - hexagonal, bihexagonal-dipyramid, bipyramid type of symmetry. Cleavage - non-existent; a separateness is sometimes marked on pinacoidal (0001). Aggregates. Dense, dispersion, dissemination. Not added the action of acids, in flame of candle melt fuse hardly. Due to a characteristic form and colouring of him it is impossible with anything to entangle. 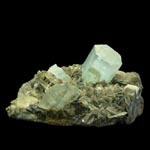 Beryl - characteristic mineral of different type of pegmatites. Sometimes be found in granites and crystalline slates. Due to high-resistivity accumulates atmospheric influences also in alluvial deposits, appearing at mechanical destruction of primary rocks, containing Beryl. Most valuable variety of beryl (emerald), always considered jewellery of the highest class. In deep antiquity emeralds obtained on the deposits of Scythia and to a great extent - Egypt. In our time the richest deposits are opened in Colombia (Chivor, Somon-Doko, Muzo, Kaskues and other). Deposits are widely known also in Brazil in the states of Minas-Zherays and Baiya, Russian - on Ural and in Siberia, African - in Zimbabwe. A less value is had deposit of India and Salzburg Alps. Found out the transparent and painted differences of aquamarine in the alluvial deposits of the Brazilian state of Minas-zherays and in pegmatites of Ural, Madagascar, Ireland and USA. On Madagascar, pink obtain in Brazil and California, rose Morganite; the wonderful crystals of this variety find also on an island Elba. Goldish Heliodor acts from South Africa and Brazil. 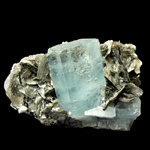 If Beryl does not fit for jeweller aims (as an emerald, Aquamarine, Heliodor and Morganite), it is used as ore on a beryllium. This element is found by a very wideuse, including at the production of easy alloys, in-use in aircraft building. Use is on jeweller business. Almost all of emeralds cut short flight (step cutting) of stair, which is named "emerald". For this purpose to the stone, to having verges, parallel a primary hexagonal-prismatic form, give an octahedral form, processing series from three overhead rectangular fasings and the same bottom. The emeralds of medium-grade cut cabochons or give a shape sphere. For aquamarine rectangular short flight of stair is most popular. The oval cutting is used, and for stone, having inclusion, external curve. This semiprecious stone is also processed as a sphere, in-use for coulombs, and as different supermodern, the very latest forms, especially widespread in Germany (EU). For Heliodor often apply an oval, a rotunda is less popular. A tear-shaped, drop-shaped form is ideal for ear-rings, as exposes the game of goldish rays, characteristic for this stone. For morganite the "emerald" cutting is most widely used. In nature presented all of tints from bluish (cyan) -green to most intensive sky-blue. Glance (glitter, glare) glassy. Crystals have the appearance of hexagonal prisms of the extended form. Natural Aquamarine gas-liquid inclusion contains sometimes. It typical mineral pegmatites, found in Brazil, on Madagascar, and as shallow crystals - on an island Elba. For this semiprecious stone the step cutting is more frequent than all used with rectangular fasings. Aquamarine - blue or greenish-blue transparent Beryl, the color of which can be compared to the color of water of tropical sea. Got the name for colouring. Once aquamarines were decorate tsar's crowns, in addition they were used as lenses for glasses (the first lenses are dated 1300 by a year). The most magnificent deposits of aquamarines are in Brazil, on one of South Africa deposits the crystal of aquamarine is obtained weighing 110,5 kg The largest from the known cut stone weighs 2594 carats. The stone of deep sky-blue color are most valued. Intensity of colouring increases after heating of crystal higher than temperature of 400oC. Aquamarine is fragile, him it is easily possible to squash! 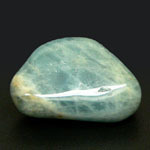 Colouring is usually up-diffused evenly: aquamarines are much more frequent, than emeralds, are transparent. Iron serves as хромофором here. The thinnest hollow tubulis, causing silvery-white high lights, are characteristic. If there is a lot of such tubulis in a stone, polished cabochons, it is possible to type after the effect of "cat's-eye" or asterism as the Hexacorallia star. The presence of different elements-admixtures causes the vibrations of physical properties. Substantially differs on the constants once popular Aquamarine -Maxis from Brazil. But presently this variety of aquamarine does not almost enter sale, because his colouring under the action of sunlight in course of time worsened considerably. Deposit of minefield mine field occurrence subsoil aquamarine is known on all of continents: most considerable from them are in Brazil (state of Minas-zherays, Baiya Espiritu-santu). Aquamarines are obtained from pegmatites, often beddings in coarse-grained granites. On Madagascar the numerous deposits of aquamarine are timed to the internal upland. In the CIS the deposits of aquamarine are known on Ural and in Transbaikalia (Zabaykale). All of other deposits of aquamarine have a local value only; it is deposits of Australia (New Sonth Wales). Burma. Sri Lanka. To India, Kenya. Mozambique. Republic of South African. To Namibia, Tanzania. USA (state of Colorado. Connecticut. California. Maine. North Carolina). 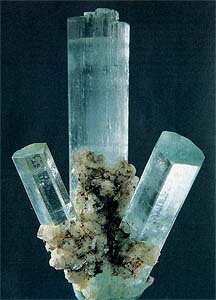 The large crystals of aquamarine meet comparatively often. The largest jeweller quality a crystal was found in 1910 on the mine of "Marambayya" in the state of Minas-zherays (Brazil). His mass made 110.5 kg length 48.5 and diameter 41-42 sm From this giant aquamarine the great number of stone was cut. Repeatedly found and crystals of aquamarine by mass in a few tons, but they always appeared turbid, opaque, and that is why useless for cutting. For aquamarines the preferable is consider the step cutting or cutting wedges at a rectangular or extended-oval form. Synthetic aquamarines do not make. It though possibly, but economic beside the purpose and unjustified expensive. 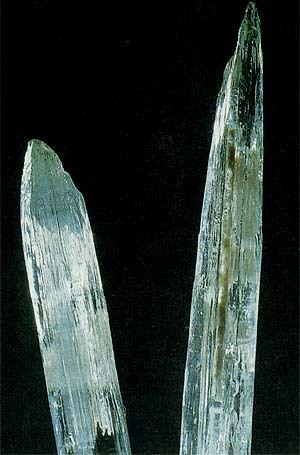 Crystals have a prismatic type with shortcolumnar, basaltiform or slightly extended prisms. Glassy brilliance and easy pleochroism, as a result of which on different directions of crystal colouring gets yellow and blue tints, meetings with dominating green, is marked. Obtained in Colombia, Brazil, Pakistan, Russia. The step cutting is more frequent than all used. Emerald - most valuable from the minerals of group of beryl. The deep and juicy tint of his green color can not be compared to anything, it is so named by "emerald-green" (and not only in an appendix to the minerals). 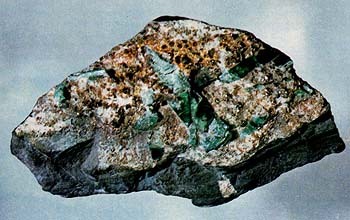 Colouring of emerald is conditioned being in his composition of ions of chrome and sometimes vanadium; it is able to resist a sunlight and heating, changing only at the temperature of 700-800oC. The emeralds of the greatest quality are transparent only. More frequent they turbid including of bubbles of liquid or gas, other minerals, and also by the healed cracks. Shallow inclusion ignore substantial defects, testifying to the natural origin of stone (unlike synthetic stone and every imitations). Specialists designate their French word "jardene" ("garden"). The stone of deep green tone are most valued; even at presence of including they are preferred by pale-colored, even and almost transparent. Glance (glitter, glare) of emerald usually glassy. Physical properties, especially closeness, light- and birefringence, double refraction, and also pleochroism at emeralds from different deposits a few differentiate. A characteristic feature of stone is enhanceable fragility; in combination with the often meetings in emeralds thin cracks of transversal separateness it sensitizes this stone very to the prelum and heating. But in relation to acids and other reagents he is steady. 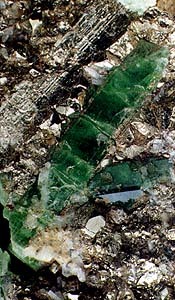 Emeralds appear at co-operating of sour magma with containing ultrabasic rocks, therefore their deposits are presented the areas of greisen of ultrabasic rocks (phlogopite micas), sometimes they meet in pegmatites or near-by them. But the best in quality emeralds are timed to the hydrothermal vein, lode, mines, to beddings in carbonaceous-carbonate slates. The alluvial mineral deposits of emerald do not appear usually, because on a closeness he is near to the quartz. Therefore the second deposits are presented only weathering barks. Goldish Beryl of yellow. His colouring varies from lemon- to golden-yellow and conditioned the admixture of bivalent iron. Now and then there are inclusion in a stone. At 250oC he is discoloured. Basic deposits are in Sri Lanka, Namibia. Valued for the diamond brilliance and colouring which changes from golden-yellow to greenish-yellow. Being mainly colourless and transparent, can have gas-liquid inclusion. Heliodor obtain mainly in Brazil, Sri Lanka and on Ukraine (Europe, CIS). For him apply mainly cutting an oval, rarer - form of Tondo. Yellow Beryls is known under the name Heliodors (from Greek. - sun). Sometimes Heliodors name lemon-yellow and orange Beryls, and Davitsonite - goldish. The yellow colouring of Beryls is conditioned being in tetrahedron and octahedral co-ordinations of Fe3+. Geliodory at times differ an exceptional cleanness and transparency, for example rare beauty brightly-goldish Beryls Transbaikalia (Zabaykale). Sometimes there are the zonally painted crystals. 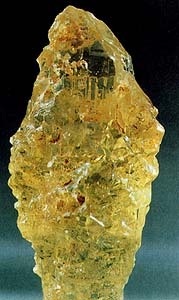 In Beryl Siberia there is a concentric zonality with more yellow kernel and bluish border. 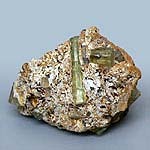 In goldish Beryl Transbaikalia (Zabaykale) is marked alternation of colouring of different types on length of crystal. Such Beryls remind polychromatic tourmalines. The yellow colouring of Heliodor disappears at heating to 400o S. Kristally here become colourless or bluish. There is distinct dichroism in Heliodors: Ne - yellow, gold, reddish-yellow, gold, No - golden-yellow, gold. Closeness of 2,67-2,69 g/см3. On a photo higher - gold yellow Beryl from Ukraine. Heliodor - light greenish-yellow, gold Beryl. It was found in 1910 on territory of present Namibia, where and got the name: in Greece heliodor is a gift of a sun. Geliodory of Namibia of slightly radioactive (admixtures of uranium and rare earths). Before similar Beryls already found in Brazil and on Madagascar. After Heliodor can be accepted citrine, Chrysoberyl, topaz, Corundum, Apatite, Tourmaline, Orthoclase, Sinhalite, synthetic Spinel, glasses. Among properties and characteristics of Heliodor, having a diagnostic value, it is necessary to select the enough low indexes of refraction, birefringences, closeness, characteristic lines of absorption and presence of the liquid and gas-liquid including, located in cracks and tubular ductings. Rose Beryls is known under two names: vorobyevite (in Russia and row of countries of Europe) and Morganite (in the USA). His crystals, rose, salmon and - much rarer - apricot-yellow, have short-prismatic and plate tablet lamellar type. It is a transparent semiprecious stone mainly, sometimes with the shallow including. There is an iridescent color in the rarest cases. The large crystals of morganite, usually jointly with quartz and feldspars, meet in granit pegmatites of Brazil, Madagascar and California. Most suitable cutting - emerald or short flight of stair. Morganite - Beryl from gently-rose to the violet color. Got the name on the name of the American collector Dzh. Morgan (in the CIS of pink, it is accepted to name rose Beryl vorobyevite). Closeness of morganite 2,8-2,9. Intensity of colouring is increased after burning at 400-450oC. The most considerable deposit is in Brazil (state of Minas-zherays), on Madagascar, in Mozambique, Zimbabwe, Namibia, USA (state of Californium). Biksbit - eatberry (gooseberry)-pink, rose Beryl. 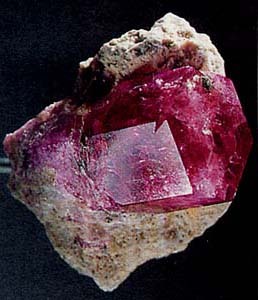 This name is used rarely, in scientific literature of bixbyite does not attribute to the independent varieties, but consider the synonym of morganite (vorobyevite). A beryllium (Be) is a destroyer of bones (ruin one's health). The general amount of beryllium in the body of people hesitates (to on various to information) from 0,4 to 40 mcg. A beryllium is in blood, bone and muscular tissue (0,001-0,003 mcg/g) and other organs. It is set that a beryllium can be deposited in lights, hepar, lymphatic knots, bones, myocardium. Participates in the exchange of magnesium and phosphorus in tissues. It is set that activity of compounds of beryllium distinctly shows up in different biochemical transformations, CPLD with participation inorganic phosphates. For today well-proven his toxic (including - and cellulotoxic (cytotoxic)), sensitizing, embryotoxic and carcinogenic effects. Getting to the kernels of cages, a beryllium is reduced by activity of enzymes of synthesis of DNA, in particular DNA-polimerazy, present pointing on the value of violations of synthesis of DNA for appearance of anomalous albumens, actings part self-antigens. There is destruction of surrounding tissues in the places of parenterally introduction of beryllium, from here a beryllium hatches very slowly. Eventually a beryllium is deposited in a skeleton and hepar. Basic displays of surplus of beryllium: defeat of pulmonary tissues (fibrosis, Besnier-Boeck-Schaumann) - inhale, a defeat of skin is an eczema, erythema, dermatosis (at the contacts of compounds of beryllium with a skin), berylliosis, a fever is a casthouse (irritation of mucous membranes of eyes and respiratory tracts); erosions of mucous membranes of gastroenteric highway (with food), violation of functions of myocardium, livers, development of autoimmune processes, tumours. Basic way of receipt preparation of beryllium in an organism - inhalation, I.e. through respiratory tracts. For people which work in terms, where breathing in a dust, containing a beryllium is, a professional disease develops - berylliosis (beryllium or chemical pneumonia). Introduction of phosphate of beryllium represses an inflammatory reaction. The antagonist of beryllium is magnesium (in an organism mainly is into cages, where forms compounds with squirrel and nucleic acids, containing compounds of MG-N and MG-O). Enhanceable maintenance of beryllium is instrumental in formation of phosphate of beryllium. "Taking" phosphates from main base part of bones - phosphate of calcium - a beryllium weakens and destroys bone tissues (hard constituent is a calcium, similar to operating of acid on a bone). Introduction of element is caused by a "beryllium" rachitis ("soft bones"). It is set that a beryllium in composition bones results in their softening influence (there is organic connecting tissues, soft and flexible bones). Food sources of beryllium: receipt preparation of beryllium with food and water insignificantly, fars accumulate in tomatoes and in sheet lettuce. On modern presentations, a beryllium is a toxic, carcinogenic and mutagene element. Immunotoksicheskie properties of beryllium are studied. Eliminaciya (conclusion) of compounds of beryllium from an organism (especially from the organs of the lymphoid system, where they are accumulated), takes a place extraordinarily slowly, during 10 years. The enhanceable level of beryllium be found at workers, contacting with an element on a production. A beryllium and his compounds have ability to get to all organs, cages and their kernels, in cellular organoids, in particular, in mitochondrion, mitochondrium. It damages cellular membranes, including - and their lipids components, violating a microviscosity. A beryllium is braked by activity of ATP-azy sarcoplasmic reticulum by inhibit of transport of magnesium and calcium. At intratracheal introduction of compounds of beryllium there is an enhanceable output of macrophage, phagocyte and polynucleare in the road clearance of teethridges. However much mobility of macrophage, phagocyte goes down here, their organoids are damaged and the synthesis of DNA goes down. On the basis of beryllium provide the exit of virus from the cages of organism. Rubidium Basic displays of surplus of rubidium: local irritation on a skin and mucous membranes; chronic inflammation of overhead respiratory tracts; arrhythmias, parahypnosiss; head pains; proteinuria. A rubidium in the organism of people acts part stimulant, stimulator nervous, cardiovascular systems, it promotes an arteriotony, renders an antihistaminic action. Stimulant influence of rubidium is set on the functions of circulation (destruction of tissues for their regeneration) of blood and efficiency of application of his salts at low blood pressure. Burning action on tissue. AntiHistaminum. Potassium is the antagonist of rubidium. A rubidium is needed: at treatment of many diseases of the nervous and muscularsystems, in particular, at a weakness, decline of forces, anaemia. In compound with an antihistaminic action can be useful at different family allergic diseases. Signs of insufficiency of rubidium: decline of appetite; lowered mood; asthenic displays; delay of growth and development; abortions; premature births. Greater part of rubidium (about 40%) gets in an organism with tea and coffee. So, there are 100 mgs/kg of rubidium in an orange-pekoe. Salts of rubidium were used for strengthening of the nervous system, and later - as an antiepileptic and hypnotic mean. There is about 1 g of rubidium in the body of people (causes a cannibalism at his want in an organism, a "syndrome of Kuka" is Australia). A rubidium is in the state related to the red corpuscles, his concentration in red corpuscles is higher, than in plasma. In a gastroenteric highway 80% is sucked in rubidium. Transport mechanisms of cages are not distinguished by the ions of rubidium and potassium, they can compete between itself. After suction accumulates in a cerebrum and skeletal musculature. Can accumulate in a placenta. A concentration in bones is 26,7 mcg/g, ovaries - 20 mcg/g, lights - 9,2 mcg/g, soft tissues - about 7,8 mcg/g. Hatches from an organism with urine (to 70%). This mineral contains radio-active components. From point of physics of crystals, correct and safe from point of level of radiation (to 19-24 milliroentgen/hour) there are natural stone of shallow and small size, thin - they are painted the negligible quantity of natural compounds of radio-active elements and contain them in two-bits. It museum mineral, especially large sizes. If minerals are painted intensively and have large sizes, probability is high that it causes the enhanceable natural level of radiation of natural stone (from 29-32 milliroentgen/hour and higher) - them it is categorically forbidden to keep in home collections and workings apartments (especially on the opened shelves and tables), expose to the serial and industrial cutting (especially in shopfloors, where plenty of personnel works). Them it is categorically forbidden to expose to the rays and ennoble in nuclear reactors and transport in great numbers (totally from 29-32 milliroentgen/hour and higher). Transportation of radio-active stone is forbidden without the sign of "radiation" and without additional declaration on a custom ("radio-active") in any amounts, especially wholesale and much. Safely to carry shallow slightly radioactive natural stone (to 19-24 milliroentgen/hour) without depending on their form on hands (in rings and bracelet, bangle-"wristlet") and on feet - as possible farther from a thyroid, birth-marks, large birth-marks (especially protuberant), from a breast, superficial lymphatic knots etc. the objects easily struck a radiation on the body of people. In any case from considering of safety and ecofriendlyness it is not recommended to carry natural minerals with an enhanceable radiation constantly and to hold the large standards of such potentially dangerous stone and minerals in an apartment or working cabinet (a house, closet and apartment, is a not mineralogical museum with the possible level of radiation from 32 to 120 milliroentgen/hour and higher for the special exposition of stone and mineralogical special safe, storage, depository, depot, storehouse, repository). Dangerous is a direct contact with a body and carrying on the body of point and diffuse sources of radiation and radio-active components (an about 50% radiation is taken in at a contact with the external surface of body and an about 100% radiation - at a reception into a radio-active or infected object). It is impossible exactly to define the level of radiation "on a peep-hole", therefore all of doubts in diagnostics potentially radio-active stone interpreted in behalf on the obligatory measuring of level of radiation of doubtful mineralogical standard a regular dosimeter and his additional verification from the side of specialists-metrologists.